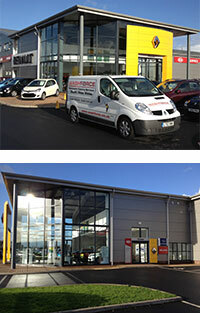 Welcome to Washforce Darlington, home of expert wash team. Whatever your exterior cleaning need, we will be happy to help bring about a lasting solution. From regular window-cleaning visits, to seasonal gutter clearances and one-off graffiti removal jobs, Washforce Darlington are your go to local servicemen in the Darlington community. Welcome to Washforce Darlington, your local exterior cleaning specialists for domestic and commercial properties across Darlington. We are qualified and trained exterior cleaning specialists that strive to provide an unrivalled service for your domestic or commercial property anywhere is Darlington. Be the requirement a specialist window clean, gutter clean, driveway clean, wall pressure wash, graffiti removal or a fascia and patio clean and much more. Washforce Darlington, as part of the national brand of ESL Facilities group offer to not only exceed your expectations when it comes to exterior cleaning services, but to also protect the environment by using green, environmentally friendly products wherever possible as part of our ‘Smarter & Greener Clean’ mantra. Do you feel as if the current state of the exterior on your commercial property is driving potential clients away? There is nothing worse than falling at the first hurdle when trying to give a positive first impression, especially when the cause of it is something as trivial as a dirty property. Fortunately, help is only a short phone call away when you speak with Washforce Darlington. We are only too happy to listen to your requirements to provide you with a clean commercial property you will be proud to display to your clients. Simply call 03335 670529 to see how Washforce Darlington can help you. Be the envy of your neighbours and book a patio or decking clean with your local Darlington technician today. We have access to the latest high-powered wash and jet-spray equipment, to ensure that you exterior decking or paving is given the thorough, professional clean for which it calls! Winter is coming!! In the late autumn and winter months, gutters invariably become clogged by a coagulation of fallen leaves, excess rain water and debris from storms.Don’t suffer stagnant, choked-up gutters, which can lead to drainage problems, water leaks and even pest infestations! When contacting trained Washforce team , you can be guaranteed that you will be seen by a real professional, who will rid your gutters of their excess clunk so water continues to run free flowing. Looking for a window cleaner in Darlington? Look no further than Washforce! Local to the Darlington area, we will ensure that a speedy yet thorough window washing service that will guarantee to leave your windows sparkling! Unlike many, competing window cleaners, with Washforce you can rest assured that your windows will be serviced by a trained technician whose calibre of service is in line with the respected brand with which he represents. Grafitti or undesired products on your home or business premises? Call our specialist cleaning team today who will use a compendium of targeted cleaning solutions to restore your property back to its former glory. We are trained in tried and proven cleaning procedures and is public liability insured.